The death of a humpback whale found off Australia’s coast has been attributed to plastic oceanic debris. According to an ABC article, the whale was found wrapped in a 25mm nylon rope, restricting its ability to swim and move in the water. The Australian National Parks and Wildlife Service reports increasing incidents where marine mammals have ingested or become entangled in plastic pollution. 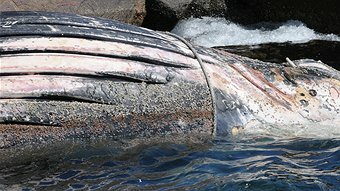 Earlier this year, another rare whale died near Puerto Rico, killed by the amount of plastic bags in its stomach. According to the New South Wales Office of Environment and Heritage, marine debris consists mostly of packaging materials, fishing gear, and raw plastics. Humpback whales were once nearly hunted to the point of extinction, and have been listed as an endangered species since 1966. Help us end stop plastic pollution at the source. Sign up for our listserve for updates and action alerts, or make a donation today. Learn more about plastic pollution and other marine debris by visiting our website.